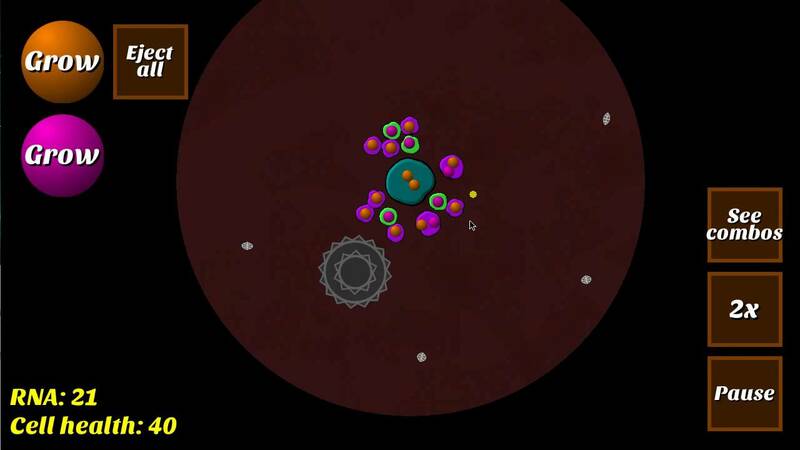 Tower defense with some physics elements, set in a petri dish. Cell tower defense. Get it? Get it? Please see README.txt for useful command-line flags that let you set fullscreen mode, window resolution, high-contrast color mode, and effect levels. See our entry page for strategy, tips, and discussion. If you haven't played our game yet at all, please go do so. You should be able to jump right in. This post is for people who've played for at least a few minutes and want to know what they're getting into. The campaign is 9 levels (1-1 through 3-3). We estimate 3 to 10 minutes per level if you play at 1x speed, for a total of about 45 to 60 minutes. I recommend beating at least Stage 2-3 if you want to get the "gist" of the game. Endless mode (unlocked after Stage 2-3) has a boss every 10 waves, and you're treated to a little dialogue for finishing each boss (up through wave 50). If you reach wave 51, you unlock the last item in the game and the waves become almost impossible. So it's technically endless, but you should call it quits at wave 51. This will probably take about an hour if you hack your save game (recommended), much longer if you start all the way over whenever you die. To hack your save game, replace the file save/quicksave.pkl. This is auto-generated every 10 seconds, or whenever you quit the game within a level, or press F5. When you quit the game or press F5, a timestamped copy of the save is also made, for your hacking convenience. It looks something like save/quicksave-20160911122816.pkl. To pick up the game from a previous save, copy the timestamped file you want into save/quicksave.pkl. Let us know if you get stuck or you want general strategy tips. Good luck! Download Dr. Zome's Laboratory here. Please let me know if you have any issues running it. Thanks!